From our humble beginnings at our first BJJ Women’s Open Mat in July ’09, our women’s rolling initiative has gone from strength to strength. From Nov ’10 Dartford BJJ was happy to pass the baton to Mill Hill BJJ and the goal of rotating the Open Mat around different women’s clubs was realised. BJJ School was next to step up to the plate and our hostess, Leoni Munslow, worked with Black Eagle who generously sponsored the event and covered our hall rental. Leoni has been a longtime supporter of the London BJJ Women’s Open Mat and she put on a fantastic event, as one participant remarked, ‘you guys are so amazingly unbossy’. Our goal is a fun atmosphere that is all about ‘us’, all about providing additional support for women on their BJJ journies, not to mention, you get that many alpha type personalities in one room – personalities that are united in a sisterly vision of BJJ – and folk make a real effort to keep it friendly! 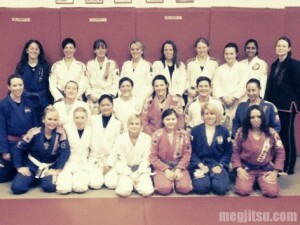 As usual, the Open Mat attracted women from a wide range of experience levels. Twenty-four women attended this quarter’s event and we would have edged 30 if a carload hadn’t hit vehicle trouble on the way down; we missed you Dominique and crew! It is so heartening to see all the new white belts that came out to the event, along with a strong group of blues and some purples; it is clear that our community is growing. I tell you, when we started the warm up and running around the hall almost bumping into one another, I was honestly moved to be in a room packed with BJJ women; it is a tremendous sight. Happily, professional photographer Mark Corpe of Fighters in Focus was on hand to capture the event on film, and his work will illustrate an upcoming article on women in BJJ for Jiu Jitsu Style. Historically we have sought to cater to all skill levels and run the open mats half drills and half sparring, this event was no different and after our warm up Leoni asked the assembled ladies if there were any particular issues they were having trouble with in their training. The age old question ‘how do I stop being squashed in side control’ was posed as well as questions on chokes and passing guard. Participants offered solutions to these issues and we drilled these approaches before a water break and sparring. We closed out the day with a trip to Nandos to recharge after a superb afternoon’s training. 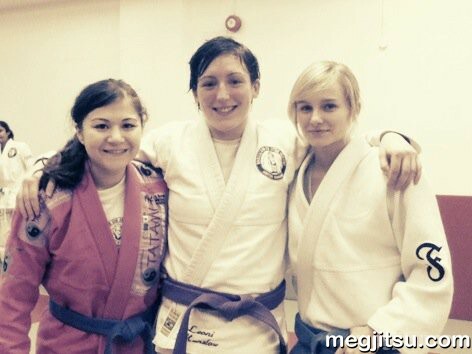 I had an amazing time training with as many of the girls as I could, from white belt to purple belt. I think, as ever, the women who attended were quietly impressed with the room’s level of awesome. Fact is, many of the women in there will, at one point or another, face each in competition and yet we are all able to leave our egos at the door and enjoy a relaxed, friendly, non-competitive day’s training. Now, don’t get me wrong, these girls *will* come for you and I had the pleasure of rolling with some very aggressive, strong, young, fit blue belts; just because we’re pals doesn’t mean we don’t take each other seriously, it just isn’t personal. As I mentioned, it was really exciting to see the number of white belts that joined us; the next generation of BJJ women is looking very healthy and I really enjoyed the chance to train with these girls. One thing struck me about women newer to the art is that quite a few asked me if I knew of some special move that would prevent badness/allow goodness such as retaining mount, avoiding a prejudicial crushing in side control, that sort of thing. ‘Fraid not. Well, with the exception of consistent practice there is no magic formula and no quick fix. That’s the beauty of BJJ. This will be my 7th year in grappling and I’ve only just scratched the surface and I have so much to learn and to improve. It is a long journey and, perhaps, an especially tough one for the lighter person. But you will get there! Trust the technique your teachers share with you and work with your coach to address problem areas and just work it in drills and sparring and eventually your percentage of success will increase. Ultimately, though, BJJ is friggin’ difficult! The challenges are great but so are the rewards when something, no matter how tiny, comes together. Isn’t that why we do this? Excitingly, other women have agreed with their coaches to offer us space for events, and we have in-principle agreements for the rest of the year’s open mats. Our Q2 event will be hosted by Tanya Coombes and held at The MMA Clinic in Romford, Essex. We will be announcing the date and times in the next fortnight. Can’t wait! In the meantime, grappling women are invited to join our Facebook Group and to Like our Facebook Page to keep up to date with our events. Not sure when JJS is going to publish the article, but it should be some time this year. Will keep you informed and thanks for your support! ‘Age-old question’ – hahaha, I knew I shouldn’t have said anything! 😉 You’re so right about there being no quick fix though. It was a fantastic learning experience and to be in a competitive but no-pressure environment was awesome. I spoke to my partner about it afterwards and the first question he asked was ‘what did you get caught in’! I realised it was the same two techniques pretty much all day so I’ve even got homework! Haha! Great to hear from you Taliesyn, was a lot of fun rolling with you – your lockdown from half guard is INSANE with those wee pins of yours. Everyone struggles with side control, especially us shrimps, stay calm work your technique keep it tight and they’ll make space eventually and you’ll be more and more able to capitalise on opportunities. I ate some serious side control on the day so is all good! That is friggin’ sweet that you learned so much! Identifying those two techniques gives you a great starting point! I learned that I gotta work on my composure and sweeps, particularly switching from one side to the other. Thank you so much – that means a lot 😀 Rolling with someone with your experience and technique but relaxed and calm attitude was a real eye-opener – I look forward to developing that calm myself, especially with the bigger, newer guys. I’ve not been able to stop talking about it – I was showing the missus the whizzer to gi-choke in Tesco’s last night! He loved it. Sorry for the wait, Taliesyn, I was out training so moderation got stalled (I have a ‘Hater’ who likes to post vulgarities that lower the tone, so have to jump through this hoop, I’m afraid). I hope that I will be able to visit London next year AND have it coincide with this fabulous event! Oh my gosh, Triin, my heart is in my throat! I have a guest room that is all yours! Keep me in the loop and we’ll get a good old fashion London BJJ Women’s welcome organised!